Netzer, a GIS and remote sensing analyst at Winrock, needn’t have worried. The internet performed, and the tool wowed the crowd. Every day for a week of rigorous meetings and training sessions, the instrument was put through its paces. And everyone from Cambodian government ministers to students to representatives of NGOs learned to use it — passing their final exams with scores of 80 percent or higher. 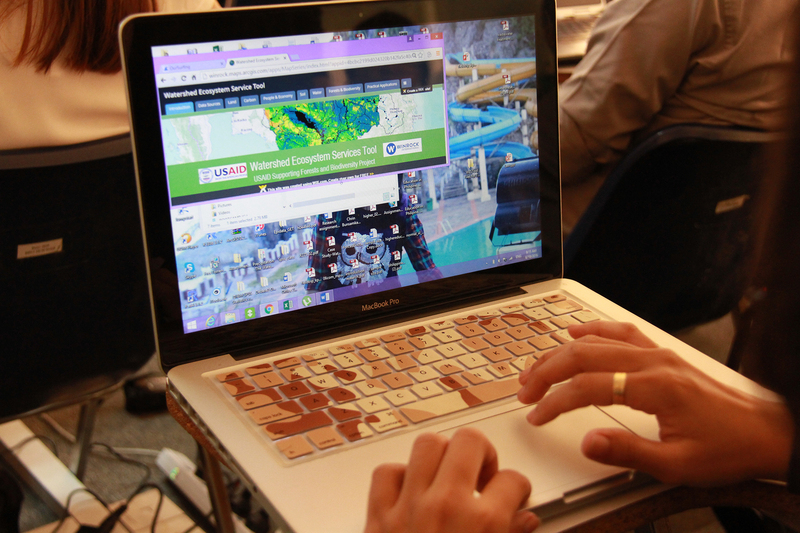 The WESTool helps users monitor water pollution and predict greenhouse gas emissions. The WESTool uses advanced science and intuitive maps and tools to analyze changes in water availability, sediment and nutrient loss, water pollution, and greenhouse gas emissions, explains Lara Murray, a carbon analyst with Winrock’s ecosystem services team. 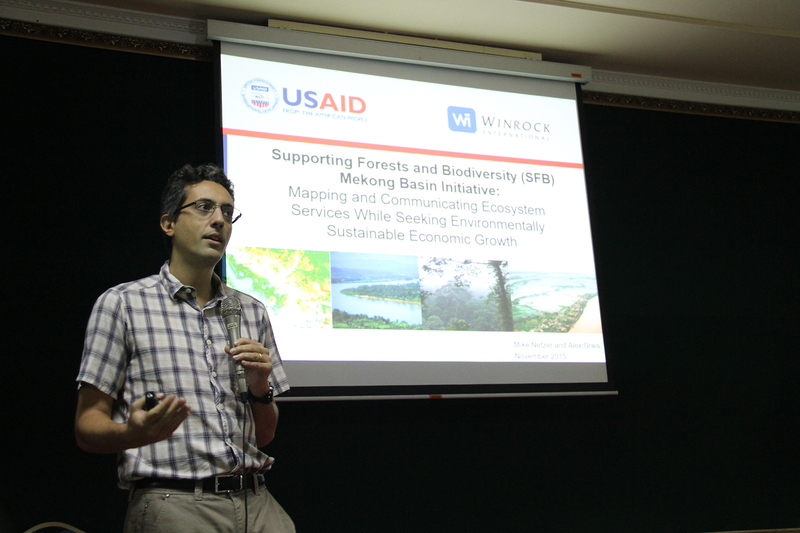 It was developed as part of USAID’s Supporting Forests and Biodiversity project (SFB), implemented by Winrock and led by Curtis Hundley, SFB’s chief of party, an early and ardent supporter of the tool. Ecosystem Services Director Sarah Walker and Ken Andrasko, senior director of Winrock’s environment group, were WESTool’s visionaries. It’s a vision that’s now a reality. 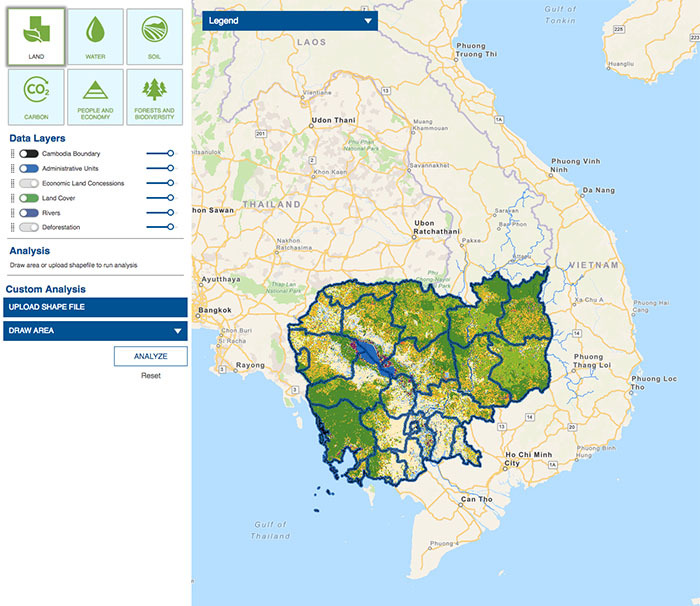 With just a few clicks on the layered map, users can monitor water pollution and sedimentation in the different watersheds of Cambodia that feed the Mekong River (where there are many fisheries), or predict greenhouse gas emissions from deforestation anywhere in the country, including the protected Prey Lang Landscape (where logging still happens, even though forbidden). Researchers, land use managers and other decision-makers can use the WESTool to determine the relative impact of building in (and removing trees from) one region versus another. Ordinary citizens can use it to visualize and assess the various ways land is being developed in their country and how this affects their ecosystem. “Cambodia has one of the highest rates of deforestation in the world,” Netzer says. Although the country still has forests, it’s on the cusp of overdeveloping its resources. By providing an easy way to measure the effects of forest loss, the WESTool is an important ally in the fight for sustainable development. Everyone from Cambodian government ministers to representatives of NGOs learned to use the WESTool — and proved it by passing a final exam. It’s difficult to understand the impact of land management decisions without proper, unbiased, science-based information, Murray explains. And that’s what the WESTool provides. It rests upon technology from ESRI, known for the mapping software ARC-GIS, and uses what Winrock’s GIS and Remote Sensing Analyst Kevin Brown calls “a renaissance of digital data” (much of it from satellites) — including global maps of forests, soil, land cover and ecosystems — as well as published scientific reports. The ecosystem services team, which works closely with Winrock’s forestry and natural resources management group, used that data, its already well-honed carbon-emissions measurement skills plus advanced hydrological modeling to come up with the finished product. Toward the end of the project, Brown and Netzer were each putting in 12-hour days on WESTool, and since they were on opposite sides of the globe, when one of them wasn’t working on it, the other one was. Another good moment was when Cambodia’s Ministry of Environment wrote a letter of support for the WESTool, “which is a big step forward,” Netzer says. Winrock’s Alex Grais, a low emissions development specialist, at a WESTool presentation in Cambodia.